family members. As serene and relaxing as the beach atmosphere is, there are some dangers you need to look out for. Each week we see patients who have sustained lacerations through their pads due to stepping on oyster shells. Apart from being razor-sharp, some pets develop an allergic reaction to oysters and because of the deep nature of these cuts, infections are not uncommon after an oyster injury. Consider reigning in your pet’s activities over rockpools and other places where oysters live. While we wear sandals or thongs to make the journey across the carpark to the beach, dogs don’t have any protection. While their pads are thick, they are prone to get burnt from the heat of bitumen. The combination of the excitement of a new environment, combined with ingesting salt water and heat from the sun can be the perfect recipe for heat exhaustion. You can avoid this by making sure your pet doesn’t overexercise and every half an hour, make sure she rests in the shade. On windy days, sand can predispose your pet to conjunctivitis by irritating the surface of the eyes. 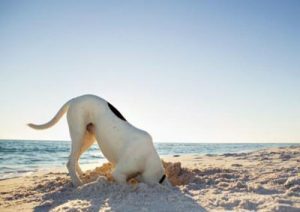 Sand is also a very unstable surface so if your pet has orthopaedic problems like a cruciate rupture or kneecap issues then it is best to carry them over the sand to avoid an acute flare up of symptoms. The beach also often has washed up organic decaying material. Some dogs love the scent of such material and may roll in it or even eat it leading to gastro signs and toxicity so keep an eye on your pet at all times.